Both the mood and focal theme of Advent has visibly changed on this Fourth Sunday of Advent. In the first three Sundays, there seems to be greater focus on the Second Coming of Christ. The last two Sundays had St John the Baptist as the main protagonist. Today, we shift our focus to the first coming of Christ at the Incarnation, at Christmas and the central figure of our contemplation is Mary, the Mother of Jesus, the Mother of God. Although the gospel reading narrates the event of the Annunciation, the Church by weaving this gospel account together with the story of King David’s plan to construct the Temple in the first reading, is attempting to draw our attention to more than just the historical figure of the mother of Jesus. Mary is the figure of the Church, and thus she too is the Holy Sanctuary, the Perfect Temple, constructed by God to conceive and house the Word of God. The Scriptures tells us nothing of Mary's hidden life. The inspired Word of God gives us no word about her Presentation in the Temple, the feast which we celebrate each year on November 21st. However, we do have the testimonies of tradition which are based on accounts which come to us from apostolic times. According to the Proto-evangelium of James, when Mary was three years of age, Joachim and Anne took her to the Temple so that she might be consecrated to the service of the Lord. The legend says that they invited the young girls of the town to walk before her with lighted lamps. As soon as they had reached the Temple, Mary, alone and unhesitatingly, went up the steps of the sanctuary (the apocryphal text speaks of her dancing with joy as she ascended the steps) where she was to remain, living in the contemplation of God and miraculously fed by the Archangel Gabriel, until the day she was espoused to Joseph, shortly before the Annunciation. In the first reading, the great King David felt uncomfortably guilty that whilst he dwelt in a grand palace, the Lord, by comparison, continued to dwell in a humble tent. Common sense and sincere piety led him to draw up plans to build God an imposing dwelling place. But God intervenes, with words of both criticism and promise. David is forgetting that God built up his entire kingdom from the moment when he made the young shepherd into a king by anointing him. And God has stood by him through all his victories. Yet this grace extends even farther: the house God has begun to build will be brought to conclusion in David’s descendants and ultimately in the great scion in whom the house will find perfection. David’s house will continue in his “Son” and will last forevermore. This is fulfilled in the gospel. The temple of Jerusalem was a figure of Holy Church and a figure of each Christian. It prefigured our churches and cathedrals, but was also a representation of a temple far more holy and august than any material structure. What then is the true temple? It is the Blessed Virgin Mary. It is here in the gospel, that we see the Temple not built by human hands but by God himself. The virgin, betrothed to the man from the house of David, is chosen by God to be his incomparable temple. God’s Son, brought by the Spirit to her womb, will make his home in her and her entire existence will serve his development into a complete man. God’s work does not first begin with the moment of the Annunciation, rather with the first moment of Mary’s existence. Therefore in the Blessed Virgin Mary, we see a perfection of all that the Old Testament had already prefigured. She is the Ark, for the Glory of God settled on her, just as the Glory of God descended on the Mercy Seat of the Ark of the Covenant. Just as Aaron's Rod sprouted miraculously in the Old Testament, so too, the Virgin Mary has budded forth the Flower of Immortality, Christ our God. On Mt. Sinai, Moses saw the Bush that was burning, but was not consumed. So too, the Virgin Mary bore the fire of Divinity, but was not consumed. In the Exodus, the Israelites were led out of Egypt by a Cloud of Light, symbolising the presence of God in their midst. So too, the Virgin Mary, as the Carmelites were fond of describing her, is a Cloud, bearing God within. Into the Holy of Holies only the High Priest could enter. So too, the womb of the Virgin Mary is the Holy of Holies into which only the Eternal High Priest Christ entered. The Tabernacle was the place where the Glory of God dwelt. So too, the Glory of God dwelt in the Blessed Virgin Mary the Living Tabernacle. It is she who holds within herself not just God’s words; as the the Ark of old held the Commandments of the Law, but the mystical Ark holds within herself the very Word of God Himself, enfleshed. With Christmas just a few days away, we are reminded once again that our Christian faith is a seamless garment that is firmly grounded in the reality of the famous Patristic dictum “For He was made man that we might be made God.” There has been but one true revolution in the history of the world and that is precisely the Incarnation in the flesh of the eternal Logos in the person of the God-man Jesus Christ, whereby the power of sin, corruption, death and the authority of Satan are shattered and the chasm between the uncreated God and His creation is bridged. 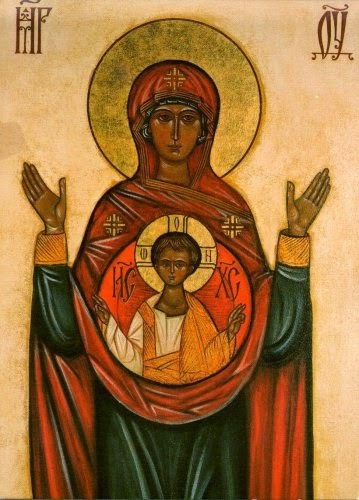 If the Incarnation is a foundational mystery of the faith then the person of Mary the Theotokos from whom Christ received His flesh and was born also stands at the centre of the faith. A faith in Christ which does not include the veneration of his mother is another faith, another Christianity from that held by the Church. A Christmas without the mother would be a meaningless Christmas, for the Word would not have taken flesh and become the source and summit of our salvation.